To not confuse newer players maybe change marksmen to commando. This only thread i bookmark on forum and again thanks for it. Excellent catch! Done and done! WT, Can you please add the splash radius for the Commandos, Jericho & the Hellhounds? Can you clarify what the damage per second is for the Thunderstorm? I am assuming it is the damage per round (30,600) * number of rounds per second (5.7) equalling 174,420 damage per second. Seems right to me, thought certain units also have Reload Times which would be factored in to DPS. Also, WT you posted in Sept of 2015 that you were hoping to get the stats up for defensive structures and Turrets. Is that still gonna happen? I'm sure we would all like to know the specifics on all the turrets. Especially the Avalanche for example which is a total mystery beyond base DPS and clearly a sustained fire rate. Especially with the release of our new Heavy Turrets, this should definitely happen. I'll see if I can find time within the next week or so to at least put up the stats for our four Heavies. Do ya think you could get us Deena's stats in advance WT? It'd be cool to get a couple of details on her ahead of time. Any time Kara or a Member of her SF Team kills any enemy unit, she gains a 10% bonus to Damage and a 5% increase to Reload Speed, up to a maximum of 200% bonus Damage (after 20 kills) and 50% increased Reload Speed (at 10 kills, thus reducing her reload time to 1 second when maxed). Can hit ground targets only. I don't think the "Can hit ground targets only" is supposed to be there. Why doesn't KIXEYE do the smart thing and just overhaul the game. So instead of putting up with this stupid and idiotic "Damage Per Second" system that barely anyone really understands, they do away with all that so the game shows us the stats for Damage per Round for the units and so on instead. Sure it would probably take a bit of time to switch around, but in the long haul, things would be easier for everyone. You don't have to keep to explaining this stuff, and we finally know what the hell all of this stuff actually means. Win-Win for everyone right? WT, can you add the Elite Legion, Baldur, & Punisher tank to the list? Can we have stats for Deena, Baldur, and the new Punisher Tanks please. When will Deena, Baulder and the Punisher be added. Also, new Helicopter units are coming this event with a Hero unit. That spreadsheet has not been updated in a while. 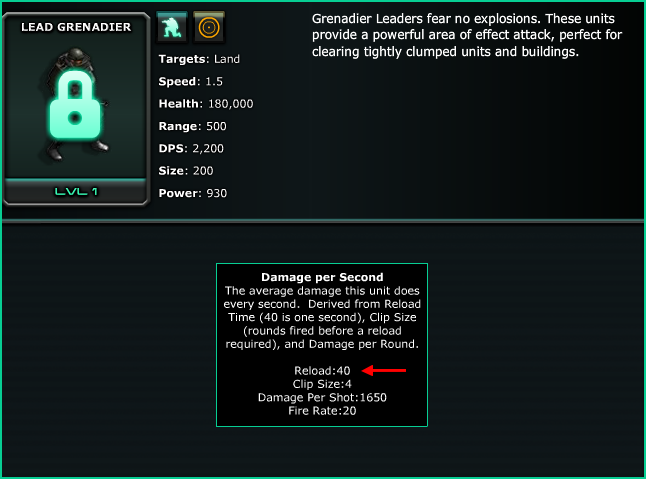 Yo WrongThinker, don't forget to add in the Grenadier and Lead Grenadier Stats. As many of you know, our current unit information screen really isn't adequate. You asked for some of that hidden info to be revealed to help you make the best decisions, both for components and general strategy. Hopefully we'll get some bandwidth to improve that screen in the future, but until then, here is some of the critical unit data you've been missing. For the time being, I'm keeping this info to Core Units and Heroes at level 20 (and Sarkis, because he's cool), because to do it for all units at all levels in the game would take me until 2020. Please let me know if there is other information you want and I'll do my best to provide it when my time permits. Replaced Marksmen terminology with Commando terminology. Changed "Splash Area" to "Splash Radius" to improve clarity. Added Splash Radius to a few more units, where needed. Also added Targeting Type, to clarify whether a unit can hit Air and/or Ground targets. A/G refers to Air and Ground. The amount of damage from every projectile the unit fires (e.g. bullet, rocket, missile, etc.). How many shots are fired before the unit must reload. The speed at which shots from the same clip are fired. Only relevant if the clip size is greater than 1, since a clip size of 1 means the unit is constantly reloading. The time it takes to load in a new clip, once the old clip is emptied. Deals 2.5X Damage to all Buildings. Deals 2X Damage to all Buildings. Note that the two shells that are fired simultaneously are actually just one round. Light Vehicles are immune to Shock. Infantry within a Moderate Radius of Sheila gain a 20% bonus to Damage and 14% bonus Movement Speed. Note that this buff does not apply to Infiltrators. Grants 100 Armor to nearby Allied Nightmares. Grants 15% increased Reload Speed to nearby Allied Hellhounds. Light Vehicles are immune to Shock. Grants 15% increased Damage to nearby Allied Ultra Tanks. Deals 2X Damage to all Buildings. Note that the two shells that are fired simultaneously are actually just one round. Added the Tempest, Doran, Jericho, and Dante. Terminology and classification updates. Major formatting and organization improvements. Added the Ultra Tank and the Thunderstorm. Added damage types to all units (i.e. sustain, burst, or area). Added Cyclone and Lead Marksman. Jackal added. Light vehicles updated to include Shock Immunity. Warhorse splash area added. Changed Damage Per Projectile to Damage Per Round, because everyone liked that more. Added information on Sheila's and Kara's hero effects. The 3.1 updated added further details to Kara's hero effects. Changed Damage Per Shot to Damage Per Projectile, since it shared an abbreviation with Damage Per Second (which is what DPS stands for in-game). Hopefully this will be clearer. can we get the stats for the punishers, hailstorms, and cyclones along with heros? Nimbus? All Turrets? Liberators? Apollos? We seriously need some updates to these stats so we can shop appropriately and understand the 'numbers'. Thanks for this critical info, WT. I'll keep a notification for this thread. Hopefully, these stats can be incorporated right into the information box on the units in the game, especially in Platoons and in the Workshop.